If you are interested in esoteric topics such as maths in the movies, beautiful pictorial proofs, mathematical juggling, ambigrams, or lacing your shoes, here are some books that you may want to check out. All of these books are available through your local bookshop or places like Amazon.com (Amazon.fr in the case of the French book on ambigrams). The books are listed in order of accessability: Anybody can enjoy the first five, people with a reasonable background in maths will be able to appreciate the books on juggling, shoelaces and the "Geometrical Picturebook". Finally, the book "Geometries on Surfaces" is something for specialists. Click on the book to go to scroll to its description. (The official blurb) A Dingo Ate My Math Book presents ingenious, unusual, and beautiful nuggets of mathematics with a distinctly Australian flavor. It focuses, for example, on Australians' love of sports and gambling, and on Melbourne's iconic, mathematically inspired architecture. Written in a playful and humorous style, the book offers mathematical entertainment as well as a glimpse of Australian culture for the mathematically curious of all ages. This collection of engaging stories was extracted from the Maths Masters column that ran from 2007 to 2014 in Australia's Age newspaper. The maths masters in question are Burkard Polster and Marty Ross, two (immigrant) Aussie mathematicians, who each week would write about math in the news, providing a new look at old favorites, mathematical history, quirks of school mathematics-whatever took their fancy. All articles were written for a very general audience, with the intention of being as inviting as possible and assuming a minimum of mathematical background. (The official blurb) Mel Gibson teaching Euclidean geometry, Meg Ryan and Tim Robbins acting out Zeno's paradox, Michael Jackson proving in three different ways that 7 x 13 = 28. These are just a few of the intriguing mathematical snippets that occur in hundreds of movies. Burkard Polster and Marty Ross have pored through the cinematic calculus and here offer a thorough and entertaining survey of the quirky, fun, and beautiful mathematics to be found on the big screen. Good Will Hunting; A Beautiful Mind; Stand and Deliver; Pi; Die Hard; The Mirror Has Two Faces. The authors use these iconic movies to introduce and explain important and famous mathematical ideas: higher dimensions, the golden ratio, infinity, and much more. Not all math in movies makes sense, however, and Polster and Ross talk about Hollywood's most absurd blunders and outrageous mathematical scenes. They round out this engaging journey into the realm of mathematics by conducting interviews with mathematical consultants to movies. Eye Twisters is all about ambigrams - words that are written or drawn so that they can be read in more than one way, back to front, upside down, turned this way and that. If you enjoy Escher's drawings, ambiguous figures, puzzles, optical illusions or mathematical recreations, you will love ambigrams (and Eye Twisters). This book showcases more than 200 ambigrams by the world's best ambigram artists, many for the first time. In particular, John Langdon the artist responsible for the ambigrams featured in Dan Brown's bestseller Angels and Demons has contributed thirty of his amazing ambigrams and written the foreword to the book. Other well-known contributors include Scott Kim and Douglas Hofstadter (the author of the Pulizer prize winning book Godel, Escher, Bach). The main part of the book consists of spreads on which ambigrams are paired with spectacular Escher-like optical illusions, photo montages, puzzles, etc., that are based on similar principles than the ambigrams. In this way the ambigrams and their graphical partners mutually enhance each other in a lot of different exciting ways. You can see an example of such a pairing on the blue/white cover of the French ambigram book shown above. Here an ambigram of Escher's name has been superimposed on Escher's famous picture "Drawing Hands". Note that both the picture and the ambigram look the same the right-side-up and upside down. Merging both gives a puzzling new twist to an old favorite. 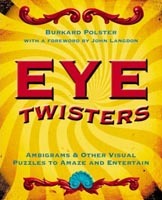 Eye Twisters also includes chapters on the history of ambigrams, ambigram puzzles, ambigrams "in action" (as tattoos, as part of art installations, in sculptures, etc. ), and instructions on how to create ambigrams yourself. Here is the somewhat outdated Eye Twisters page from 1997 which originally served as something like an online book proposal for a book on ambigrams. Although the actual printed book is also about ambigrams, it bears very little resemblance to the book that Burkard had in mind originally. Still, the ambigrams featured on these pages may still be of interest. The main part of this book consists of twenty-three self-contained spreads dedicated to simple pictorial proofs of some mathematical gems: 1=0.99999..., Pythagoras's theorem, exactly five Platonic solids, Cavalieri's pinciple, volume formula for cones, pizza pie connection between the circumference and area of a circle its generalization to the sphere, mathematical induction, the infinite staircase, etc. Although this book only has 56 pages it took a whole year to put it together. 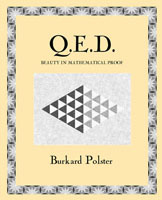 The reason for this is that Burkard's aim was to capture the beauty of the proofs by pictures that really "say more than a thousand words" and are beautiful in their own right. Since there is not much of a difference in price, I very much recommend that you check out the American hardcover edition of this book. This edition of the book is printed on much better paper than the other two editions using amazing 1200 dpi printers that really do the drawings justice. Scientia: Mathematics, Physics, Chemistry, Biology, and Astronomy for All Walker & Co., U.S.A., 2011 The first of the four parts of this collection of Wooden books is Burkard's book Q.E.D. : Beauty in Mathematical Proof. This is the first book in French on ambigrams. Its focus are the many mathematical aspects of ambigrams. Most of what is contained in this book also made it into Eye Twisters. (The official blurb) Crisscross, zigzag, bowtie, devil, angel, or star: which are the longest, the shortest, the strongest, and the weakest lacings? Pondering the mathematics of shoelaces, the author paints a vivid picture of the simple, beautiful, and surprising characterizations of the most common shoelace patterns. The mathematics involved is an attractive mix of combinatorics and elementary calculus. This book will be enjoyed by mathematically minded people for as long as there are shoes to lace. (The official blurb) Learn to juggle numbers! This book is the first comprehensive account of the mathematical techniques and results used in the modelling of juggling patterns. This includes all known and many new results about juggling sequences and matrices, the mathematical skeletons of juggling patterns. Many useful and entertaining tips and tricks spice up the mathematical menu presented in this book. There are detailed descriptions of jugglable and attractive juggling sequences, easy zero-gravity juggling, robot juggling, as well as fun juggling of words, anti-balls, and irrational numbers. The book also includes novel, or at least not very well known connections with topics such as bell ringing, knot theory, and the many body problem. In fact, the chapter on mathematical bell ringing has been expanded into the most comprehensive survey in the literature of the mathematics used by bell ringers. Accessible at all levels of mathematical sophistication, this is a book for mathematically wired jugglers, mathematical bell ringers, combinatorists, mathematics educators, and just about anybody interested in beautiful and unusual applications of mathematics. This was Burkard's first book. Here is the blurb that he put together to advertise it. The Picture Book project started with the following question: How can I convey to my students, colleagues and friends some of the beauty of the kind of mathematics I am obsessed with? Lately, whenever it comes to dealing with this question, I start by showing them some of the pictures in the Picture Book. Pictures is what this book is all about; original pictures of everybody's favorite geometries such as configurations, projective planes and spaces, circle planes, generalized polygons, mathematical biplanes and other designs which capture much of the beauty, construction principles, particularities, substructures and interconnections of these geometries. The audience I had in mind while writing and drawing the book is fairly broad and I have tried to make it as appealing as possible by including lots of stereograms of the spatial models, games and puzzles and instructions on how to construct your own pictures and build some of the spatial models yourself. This was Burkard's second book. Here is the blurb that he put together to advertise it. The Euclidean plane and the geometry of circles on a sphere have a number of features in common. For example, the point sets of both geometries are surfaces, the lines or circles are curves that are nicely embedded in these surfaces and both geometries satisfy an "axiom of joining"---in the Euclidean plane two points are contained in exactly one line and in the geometry on the sphere three points are contained in one circle. These two geometries are just two examples of a host of classical examples of geometries on surfaces. This book is about these classical geometries and their close relatives which live on the same surfaces, have the same kind of lines and satisfy the same axioms as their classical counterparts. Our book tries to summarize all major results about geometries on surfaces. It also includes many results about these geometries that will appear for the first time in this book.